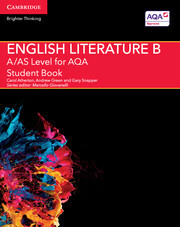 Written for the AQA A/AS Level English Literature B specifications for first teaching from 2015, this enhanced digital resource is suitable for all abilities. Helping bridge the gap between GCSE and A Level, the unique three-part structure provides essential knowledge and allows students to develop their skills through a deeper study of key topics whilst encouraging independent learning. 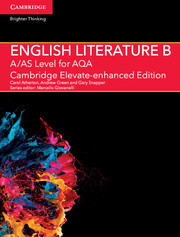 Cambridge Elevate-enhanced Editions include rich digital content such as video tutorials and extensive annotation tools. Available online and on tablet devices through the Cambridge Elevate app. Cambridge Elevate enhanced editions feature rich digital content, including video tutorials covering key specification topics and interviews with writers and academics. CambridgeElevate enhanced editions allow teacher–student messaging, helping you connect with your class in a timely and practical way. Suitable for all abilities, incorporating differentiated support and providing opportunities to stretch the more able and support those who need it. Unique three-part structure will help bridge the gap between GCSE and A Level, support students in developing their knowledge and skills, and prepare them for assessment, studies and life beyond A Level. Specifically addressing the revised specification, these resources offer support for the demands of unseen poetry and developing skills in comparing texts within literary genres. Supports both AS and A Level teaching of the new linear specification with AS content signposted throughout. Carol teaches English at Bourne Grammar School in Lincolnshire. She has written widely on A Level English Literature and the transition from post-16 to degree level study, and co-authored a teaching English Literature book with Gary Snapper and Andrew Green. Dr Atherton is a Fellow of the English Association, and a member of NATE's post-16/higher education committee. She has worked with a number of organisations (including the English and Media Centre, QCA, the British Council, the English Subject Centre and the English Language Schools' Association) on the teaching of English, curriculum change and continuing professional development. She has written for a range of publications aimed at students, teachers and academics.